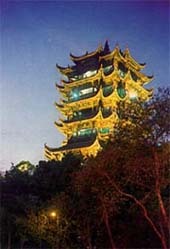 Yellow Crane Tower sits on top of the Snake Hill at Wuchang. It enjoys the fame of "the best scene on earth" in ancient times, equally famous with Yueyang Tower in Hunan and Tengwang Tower in Jiangxi. Yellow Crane Tower was built in 223 with a wooden structure. Fires and wars had caused destruction to it time and again before it was once again burnt down in 1884. The tower, which was first built as a watchtower for military use, developed into a gathering place for scholars to have farewell banquets to friends. It became ever more well-known for a poem by Cui Hao of the Tang Dynasty, Yellow Crane Tower. It was rebuilt in 1981 and the construction took four years. The new building is 51.4 m tall: 5 stories seeing from outside but actually l0 stories inside. It is really the best place to viewing the surrounding scenery by the Yangtze River.